We’ve all had those family photo fails, right? The ones where the little sister is making a face, brother’s picking his nose….or Mom’s hair was sticking up and no one told her! Well how about tossing that bad photo – and stamp a bunch of images to make your own “photo”? Affiliate links may be used, read more. I thought of this idea when looking at the Moose Crossing stamp set by Memory Box….lots of little moose, and they just cried out to be in a scene together! 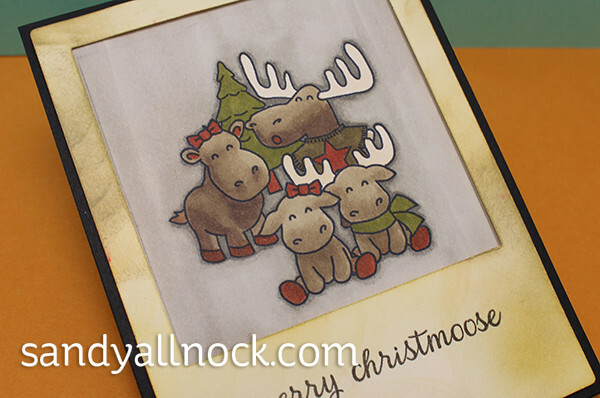 The video shows the coloring of the moose image in an old-timey colorway – and readbelow for a little more on the other two cards too. Watch the video below, or click HERE to see it in HD on YouTube! The moose stamps, as most moose stamps go, had all male moose – girl moose have no antlers, so I just masked them off to create Mama Moose and little girl moose! The other two cards here use mostly the Gnome for Christmas stamp set – it has one gnome but two bears, a penguin, and lots of other fun little stamps! (And my patrons get to see the coloring of these two images as their bonus video this month!) I think this scene with the bears and the little penguin would be great for a couple who has an adopted child, don’t you? The gnomes were so much fun – and so easy too! I masked out the beard to create the girl – and also the bottom of the gnome’s pants so I could give her a straight skirt. Cute, isn’t it? Freezy Fellas – lots of different sized snow people! Easy to create a scene and mask it. Party Monsters would be hilarious dressed up as your family members! Hoot hoot – how about some owls! 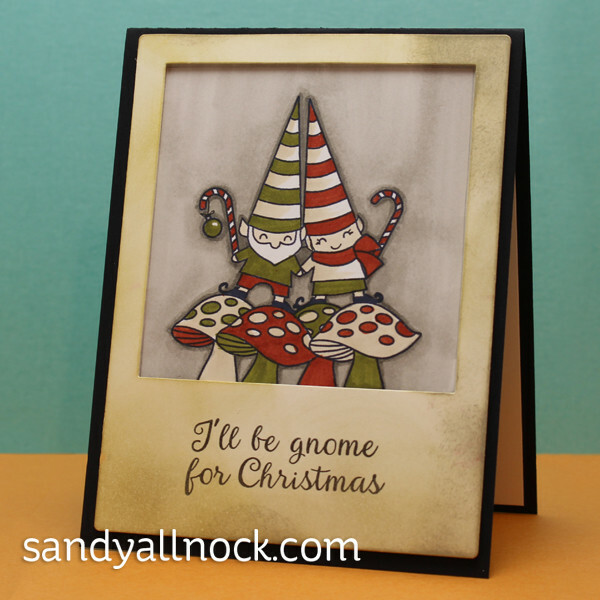 While the die that I used is a full-card-coverup die and is no longer available, there are lots of other polaroid types of dies by lots of companies…I’ve linked you to a few, and here’s another of the gnomie pairs with a smaller frame. Lots of great ways to use the idea of stamped family images! So sorry for my delay in commenting–bad week at work. As always, you’ve taken creativity to a different level. I would have never thought of this twist, but it’s simply delightful. Thanks Sandy! Now that is quite a family.!!! Love this. You are so creative!, Love your work…please keep sharing. I really like your video. Your cards are so cute. I love not only your card designs, but also all the colors you used on each card. Oh my….how happy & cute! 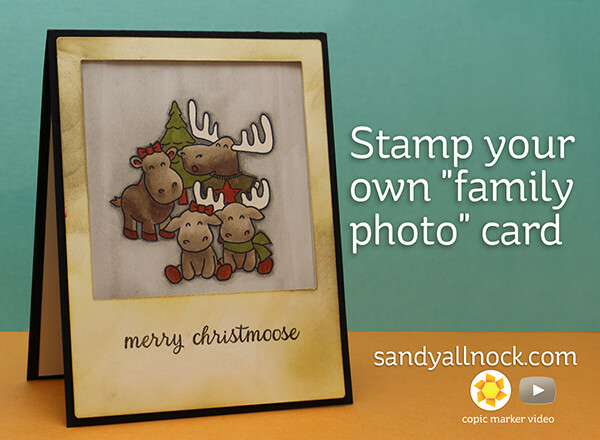 Really cute idea – Sandy, I hope you can help me regarding watercoloring on a stamped image of a tree from Hero Arts. It was a color layering stamp, using lots of colors and I think you used Tim Holtz ink but then touched the color spots with a brush. Did I imagine this in a dream or did you do it and if so, please direct me to the video again. Thanks in advance. This is an awesome! Idea, just hopefully you either don’t have too many cards or a family of 10! Thank you Sandy for continuing to show us artistic things, but the “punny” sayings just cross the line-being that “Christmas” is about our Saviour being born- please reconsider the mockery/comedy which comes too easily in this industry. God bless you. Absolutely adorable! I love the moose stamp set. Thanks for sharing these wonderful cards. Such a fun idea! These are all so cute! Thank you so very much for the wonderful inspiration. The adoption polar bears is our family! You are a blessing! Adorable. I just finished my cards. Can’t believe it but I did hybrid this year. Simple, both t still took 2 days. This year ran out of days for my decked out cards.